As you dive into the world of coupons there are dark corners you really don’t want to venture into. Sometimes though you unknowingly get caught by something that didn’t seem bad. There are lots of coupons out on the internet that aren’t “good” coupons. There are also lots of ways to misuse a coupon. Always follow the words on the coupon. If it says it is for a 6oz box, then buy the size indicated. While it might work for another size or even product that is fraudulent use of the coupon. Don’t intentionally use expired coupons. If your store has said that it is okay, you should still ask before using one on every trip. Most stores DO NOT allow any. The new databar released a couple years ago (replacing old barcodes) will now beep if your coupon is expired. You should never make a copy, scan, or fax of a printable coupon in any way. There are lots of security features built into these coupons. While they may scan in the grocery store – the store will never get reimbursed for them. The unique 2-D barcode on the upper left is a different number for every coupon you print, even for a second print of the same coupon. The dotted line around the entire coupon is really text. It has your user id, the date and time and coupon offer information printed – repeating at least 35 times around the coupon. This is also printed at the bottom of the expiration date box. The long barcode at the bottom also has a portion of the unique 2-D barcode number in it. These databars are much more specific and have replaced the original barcode on most coupons. There are many coupons that are passed around in emails that are for FREE products. You’ll also see these on ebay and coupon trading sites. These all fall into the “too good to be true category”. Most of these have been scanned from a coupon that someone received from a manufacturer directly. Don’t get mad at the person that sent it to you, they have been passed around for years. Manufacturers rarely if ever release printable coupons for free products. If they do it is not often through a PDF coupon. To see a full list of coupons that are fraudulent go here. You’ll also notice many of these have rewards offered for catching the original person that created the coupon! 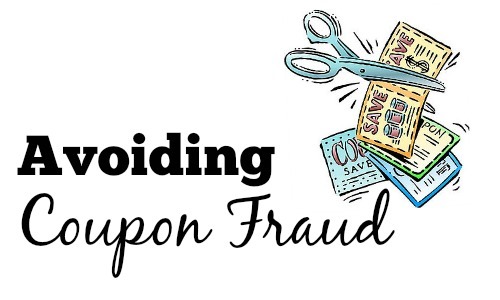 What are the consequences of Coupon Fraud? If you use coupons incorrectly (more than one manufacturer per item, not for the right items, expired etc.) it does get caught. The store may accept it, but during redemption someone will lose out. Stores have to show the number of products sold along with the number of coupons redeemed, if they have more coupons then the manufacturer doesn’t pay. If the coupons are too far expired, the manufacturer doesn’t pay… you get the idea. Sometimes the loss falls to the manufacturer, but in the end whoever pays… they do pass the cost on to you. Stores make stricker policies and get onto cashiers so much that cashiers hate couponers, or manufacturers raise prices on products to compensate for their losses. In the end your actions end up costing a lot of folks. One other big thing to know, coupon fraud is prosecuted. The largest group working to keep couponing ethical is the CIC run by Bud Miller. They keep an inventory of fraudulent coupons and work with manufacturers and stores to make stronger couponing systems. If prosecuted for fraud you could face prison time, fines or more. In case this has caught one of you, don’t start hiding in dark rooms. Just stop. Start playing by the rules and living on the right side of couponing. We can save a ton of money saving on legitimate deals!